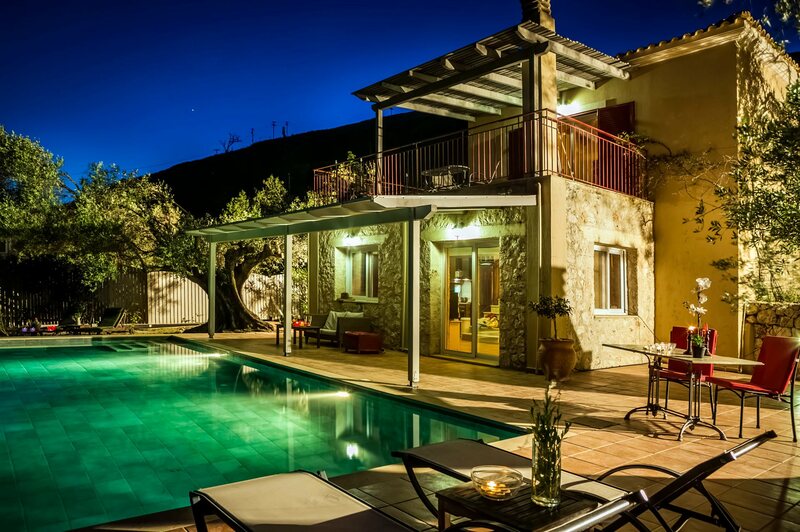 Villa Morea is a delightful 1 bedroom couple's hideaway set in the hills above the village of Ratzakli, close to Old Skala, on the South Coast of Kefalonia. The large infinity pool and terraces have fantastic panoramic views across open countryside, down to Mounda Bay and across to the neighbouring island of Zante. The house is surrounded by Mediterranean flora providing plenty of natural shade. The resorts of Katelios and Skala are a short drive away with shops and tavernas. Air conditioning/heating in the lounge and bedroom, pool heating and WiFi are included. A romantic and stylish hideaway with amazing views over the infinity pool and beyond - everything you need to relax and enjoy this beautiful island. A large infinity pool is the centre piece of the outdoor pool terrace with plenty of room surrounding it for sunbathing. The tiled patio is partly covered for extra shade with a comfortable seating area. It's a great place to enjoy the sunset and an aperitif before lighting the BBQ and cooking up an alfresco dinner to be enjoyed on the dining table and chairs. A shared driveway leads to a private parking area. From here, follow a short path to the secluded garden and up to the front entrance. The front door opens into the open plan living area with contemporary decor, complemented by the exposed stone walls. There's a fully equipped kitchen and the lounge area with a sofa, TV, feature fireplace and compact dining table and chairs. Sliding patio doors from the lounge lead out onto the covered patio/pool area and flood the villa with natural light. A central staircase leads up to the first floor . On the first floor there is a brightly decorated double bedroom with an en suite shower room and fitted wardrobes. Patio doors leading out onto the partly covered balcony with picturesque views across the sea to Zante, the perfect spot for a morning coffee or sundowner. This villa has applied to be licenced by the EOT Greek licensing association. The licence number will follow. Villa Morea is set on the slopes above the village of Ratzakli, in South Kefalonia. It looks down over olive groves to Mounda Bay, and across the Ionian Ocean over to the neighbouring island of Zante and mainland Greece. The small resort of Katelios, a former fishing village, is 10 minutes' drive along the coast. Alternatively, head to the larger resort of Skala with its long expanse of sand/shingle beach and selection of shops and tavernas, 15 minutes' drive away. Katelios has a mini-market and bakery. The larger resort of Skala has a selection of mini-markets, a small supermarket, a couple of bakeries, a butchers and assorted gift shops. Most are located on the main street running from the top of the village down to the beach road. Skala has retained much of its original Greek charm and offers a large selection of bars, tavernas and restaurants serving local and international cuisine. Katelios also has a few bars and seaside tavernas in the centre of the village and on the waterfront providing the perfect setting for an evening meal. The nearest beach is Kaminia in Mounda Bay a 10 minute drive away. It's a beautiful sandy bay, visible from the villa with crystal clear water. This beach is protected due to it being a nesting ground for Loggerhead Sea Turtles and night-time 'turtle watches' are organised. Skala is well known for its long sand and shingle beach against a backdrop of pine trees and is only 15 minutes' drive away. Both Kaminia and Skala beach have sunbeds and umbrellas for hire as well as a large variety of water sports. Daily cruises and a water taxi depart from Skala Beach to Zante, Ithaka and other beaches. Another great option is Katelios Beach, an un-commercialised sand and shingle bay. Adrenaline seekers will love Kefalonia for its water based activities on offer with jet skis, kayaks and inflatable donuts available for hire from Skala Beach. For a more relaxed way to see the island, boat and glass bottom boat hire is also available from Skala Beach - a range of activities sure to please everyone. Alternatively, venture inland and try horse riding, 40 minutes' drive away near Sami. Skala Village itself has the remains of a Roman villa constructed in the 3rd century AD. The house belonged to a wealthy owner and the floor has well preserved mosaics depicting gods and animals. Take a boat tour through Melissani Lake, a natural cave system where part of the roof has collapsed, reachable within an hour's drive. The historic Old village of Skala is a great place to explore on foot. Kefalonia is dominated by Mount Ainos which has been designated a national park. A tarmac road goes all the way up to its peak 1,628m above sea level giving panoramic views of the Island and across to Ithaca and Zakynthos. The best time to walk is spring and autumn when the temperatures are lower. Villa Morea is not available to book for season as it is sold out. Take a look here at the Kefalonia villas that are currently on sale. There are places in Lassi, Agia Efimia, Argostoli and Fiskardo that offer an opportunity to scuba dive and our representative will be able to give more information.